Forty years ago, a group of 40 families arrived at a barren hilltop in the heart of Samaria and established Ariel, which has become a thriving city in the territories. 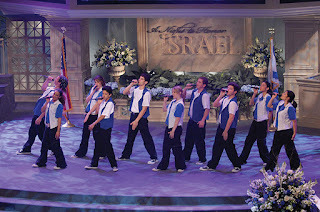 The leadership of Ariel is making six stops in the United States on a 40th anniversary tour next month, and two of the gala events are in Alabama. Ariel Mayor Eliyahu Shaviro and Avi Zimmerman, executive director of American Friends of Ariel, will be in Birmingham on Nov. 20 and Mobile on Nov. 21. Other visits are in New York, Tyler and Dallas, Tex., and Miami. The events will also feature the Celebrate Ariel Performance Troupe, which combines two of Ariel’s leading youth performance groups and the award-winning Ariel International Folk Dance Troupe of Dora and Masha Litvak. In March, Shaviro and Zimmerman visited Birmingham and Mobile in preparation for the 40th anniversary celebrations. In Mobile, they met with Mayor Sandy Stimpson at his home. In 1974, Ron Nachman was asked by the Israeli government to find a group of families to start a community at a barren hilltop in the heart of Samaria. Tents were erected in early 1978, and the community began that summer with 40 families, and Nachman as founding mayor. Nachman, who died in 2013, established many of the connections between Alabama and Ariel. Shortly after his death, he was awarded the Israel Prize for building one of Israel’s model cities. Today, Ariel has over 18,000 residents, is the fourth-largest community in the territories and features Ariel University, which has an enrollment of 14,000. The Birmingham event will be at Temple Emanu-El at 7:30 p.m. The event is free and open to the community. A VIP reception will start at 6:30 p.m., tickets are $45. In Mobile, there will be a VIP event at Spring Hill College’s Gautrelet Room, starting at 5:30 p.m. VIP tickets are $35. The 7 p.m. program, which is free and open to the community, will be at St. Paul’s Theatre. Mobile became a sister city with Ariel in August 2008. Ariel is home to Israel’s premier outdoor training site, the Ariel National Center for Leadership Development, which was initiated by Heather Johnston of Birmingham. The center provides a one-of-a-kind, experiential platform which trains the next generation of Israeli and international leaders. Modeled on Johnston’s JH Ranch in California, the Ariel center has training programs based on Biblical narratives, to give Israeli leaders vision for the future through a bond with the past. The organization sponsors trips to Israel for U.S. Representatives and Senators. Government-sponsored Congressional delegations are not permitted to visit the territories. The group has organized four tours, including one this past summer with five Representatives and a Senator from Oklahoma. The groups visit Ariel, among other communities in the area. They visit factories where Jews and Arabs work together and explore the repercussions anti-Israel boycotts have on Arabs, and explore the region’s history. Tickets to the VIP events are available here.